There are two things we need to know before we start the design process: what is the measurable outcome we are looking for and what learner shift has to take place to create the outcome. Trainers share that often they get requests for content, rather than outcomes. For example, you might get a request for a teambuilding workshop when the real issue is that performance conversations aren’t happening in a productive manner. Quadrant 1-Is it a difference in what they value? Quadrant 2-Is it a difference in what they understand or know? Quadrant 3-Is it a difference in competency level? Quadrant 4-Is it a difference in their ability to adapt the information to different settings? If you were tasked with designing training to improve guest care at the front desk, you would first have to determine which of these dimensions of performance will lead you to the desired outcome. This makes the process of sifting through all the possible content much easier. This entry was posted in instructional design, training design and tagged 4MAT, Jeanine O'Neill-Blackwell, learner outcomes on March 16, 2009 by 4MAT 4Business. 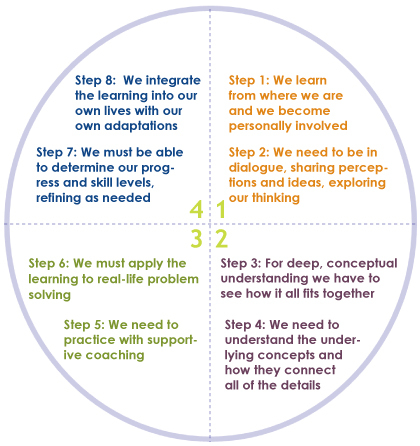 4-Build your design by intentionally placing activities in the 4MAT design wheel. As we began the design process, I was reminded of Pareto’s Principle–the 80/20 rule. Pareto illustrated the impact of the Vital Few. 20% of your customers provide 80% of your revenue. 20% of your activity generates 80% of the results. In designing training, more is not more. 20% of the content is truly important. Figuring out what the vital few behaviors are that will generate 80% of the outcome we are looking for is the single, most important part of the design process. I am convinced that the first 20% of the design process—defining the outcomes and vital behaviors–contributes 80% of the success of the design. This entry was posted in instructional design, training design and tagged 4MAT, 4MAT model, Jeanine O'Neill-Blackwell, learner outcomes on March 13, 2009 by 4MAT 4Business. Powerpoint has gotten a bad rap. Powerpoint gave the power to design to the people. Yes, we the people have abused that power, a bit—100’s of slides in 12 point font each filled with competing images and points to be made. With a bit of self-control, powerpoint can be a dynamic and powerful storytelling tool. A great story begins by drawing the audience in. It takes the learner on a journey–writers call it a “story arc”. And, it ends with a big finish, a moral, a point to be made. Think about Al Gore’s Inconvenient Truth–it all began with a story being told through powerpoint. This entry was posted in instructional design, learning, training delivery, training design, Uncategorized and tagged 4MAT, powerpoint, storytelling on March 3, 2009 by 4MAT 4Business. What Would Google Do… with learning design? I just finished reading Jeff Jarvis’ book, What Would Google Do? Jarvis does a great job of moving the learner from passive reader into engaged learner by asking questions. What Would Google Do? has us ponder what we might learn from history’s fastest growing business. Jarvis suggests that involving your audience in the creative process is a key element of the success of Google. How can we enable stakeholders to talk, share what they know, support each other, create together? How do we synthesize all the content “out there”? How do we make it easily findable? How do we create the ability to “mash-up” content and customize it, as needed? How do we involve our audience in helping us create content? How are you involving the learner in the creative process? What tools are you providing for the learner community to connect, share and create with? Would love to hear from you. 1Jarvis, Jeff. What Would Google Do? New York, NY: Harper Collins, 2009. This entry was posted in instructional design, learning, training design and tagged tr, training, training delivery, training design, What would google do? on March 3, 2009 by 4MAT 4Business.